The Best Presents for a Two Year Old – In Popitha’s Opinion! 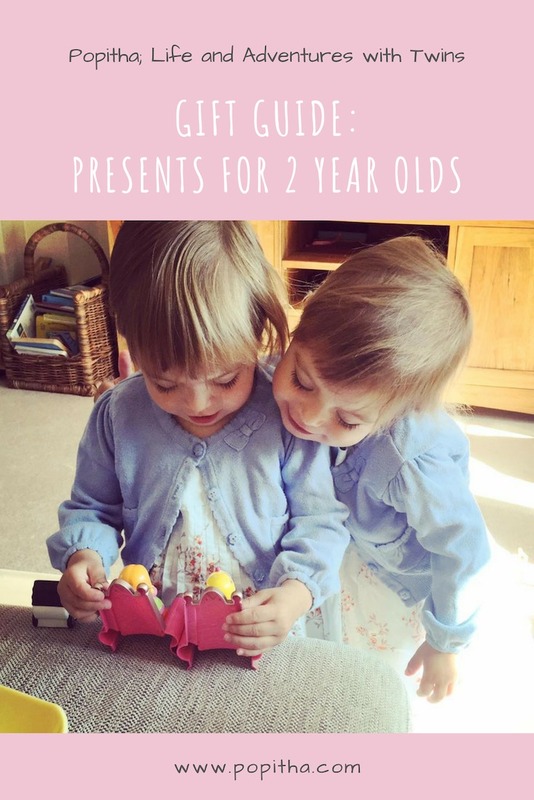 As some of you may know the twins turned two a few weeks ago and I really struggled to know what to get them. I bought them far too many toys when they turned one, things that weren’t really age appropriate but `I got over excited that it was their birthday and wanted to buy them lots. What I should have done is put all of that money into wine shares to get me through the next year!! I have taken this opportunity to help those of you out if you have children with birthdays approaching, or thinking ahead to Christmas already! Therefore, I have written a list of those toys that ‘The Popitha Twins’ have enjoyed playing with since their birthday. Below is a list of 14 products that I, as a mummy can recommend to you. I have them, we own them, my girls love them! A Strider Balance bike is the best toy for a 2 year old! Strider are the industry leaders of balance bike manufacturing. They won’t warp or crack like wooden toy bikes. A child learning to ride a bike using stabilisers, requires A LOT of adult supervision, particularly once those wheels come off, when you will need to hold the bike and be prepared for falls and tears. Your child can teach themselves with a balance bike as they just learn to balance at their own pace. Because Strider’s are lighter and have a lower seat position of any other brand we start them younger too. From when they can walk they can ride a Strider Bike. It’s a great way for your child to learn independence and confidence at a young age! It seemed like it happed over night, but suddenly the girls have become doll obsessed! They love them and the instinct to care for babies is amazing. The also think all the accessories that go with dolls are awesome too. Prams, highchairs, cots, baths! 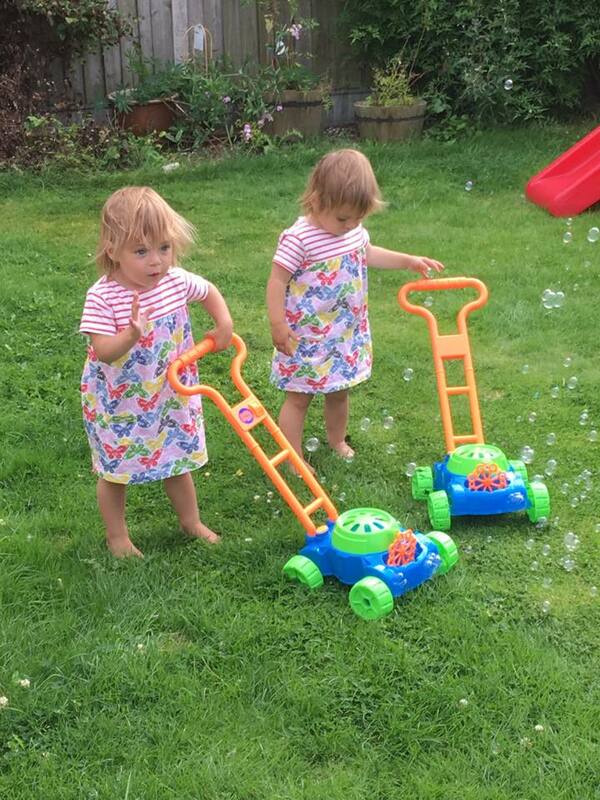 The girls got the ‘Toot Toot’ cars for their first birthday but are loving this range even more! They especially love it when a character sits on the toilet and it reminds them to flush! Just make sure you stock up on bubbles as you get through them super quick! My girls adore these. They are just the right size for them to handle with their little hands. The girls love carrying them about and rocking them to sleep. Nanchen dolls are hand made in Germany. Their faces are hand painted so that every doll is unique, with each one having its own individual charm and character. Perfect to play with on its own, or in a shop situation. It lends itself to a number of different role play situations. This product was perfect for the girls and they played with it in a variety of ways. Upon opening the box, the instantly pretended to eat the cakes. They are beautifully painted and look inviting which encouraged the role play instantly. We also introduced money and practiced counting coins out to pay for cakes. We have started with a few different sets here – the Number train and a Princess Castle. The little train drivers which come with the set will help your little ones to practice early number recognition and counting skills as they build and play with this colourful train. They use the decorated bricks to teach your child about numbers and counting. Duplo products are specially designed to be fun and easy for little hands which encourages building and role-play. But the burning question is do you keep each set in separate boxes, or mix them up?! Orchard toys are always a favourite. They have such a variety of toys that are suited to children of all ages from 18 months. They are all educational in many different ways. Here are a selection of games for this age group. * These products were gifted to me but opinions are my own.